Our drive from Carlsbad Caverns to Alamogordo, New Mexico was spectacular. 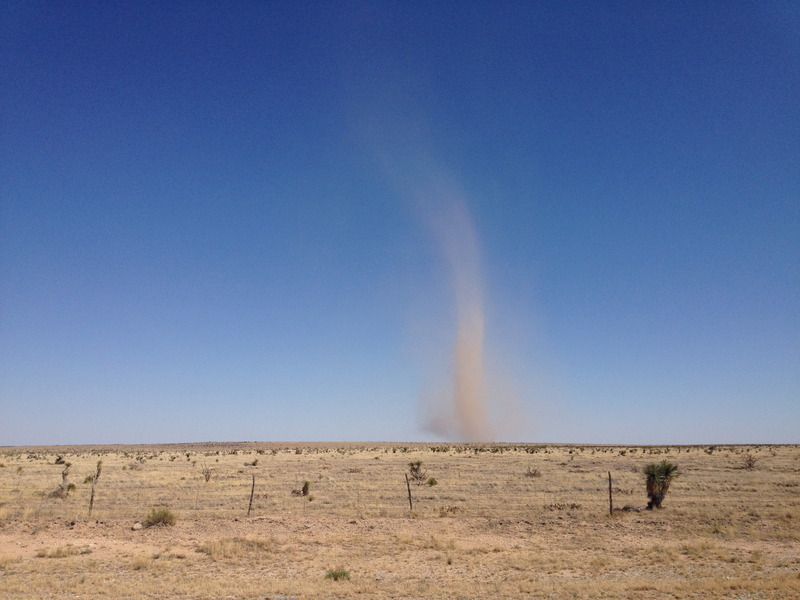 We saw wild dust tornadoes dancing across the dry desert, constantly gaining momentum then fading away into a puff of dust. We drove through Lincoln National Forest, where our surroundings changed from flat desert to mountainous alpine forests. When we reached the 9,000 feet above sea level town of Cloudcroft, it was like we had been transported to Colorado. On the way down the treacherously steep and snaky road, we could see Alamogordo below, sitting pretty at 4,300 feet. Although the wind was blowing from the south, picking up snowy gypsum sand from White Sands and obscuring the city in a cloudy haze. 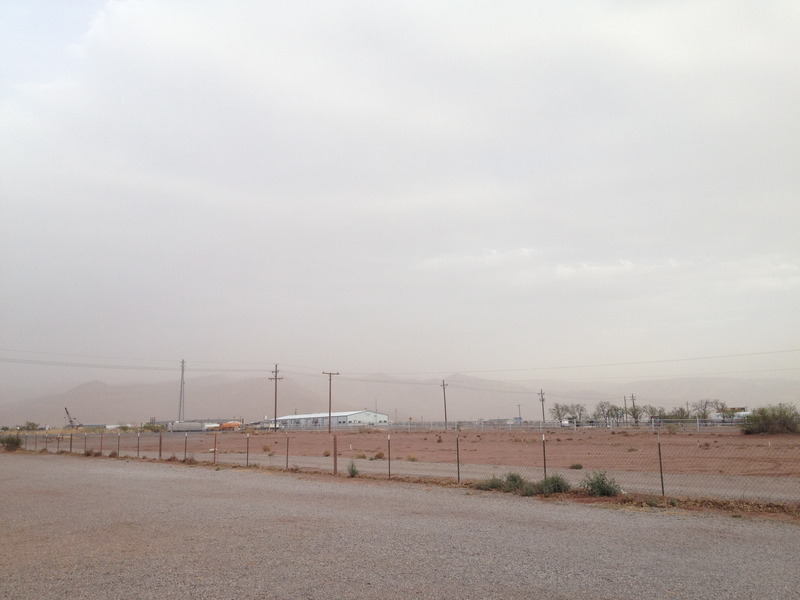 Hazy Alamogordo. Those aren't clouds, it's sand being blown from White Sands. We stayed at a family-owned campground with a friendly host, just a few miles north of Alamogordo. There's a giant military base just south of town, where they do training exercises with F-22 fighter jets for two hours every afternoon. The local radio jockeys kept referring to it as "The Sound of Freedom" which we found hilarious. Because it actually sounds like crazy powerful jet roaring overhead. I guess that's what freedom sounds like? Running up and sledding down was awesome...but exhausting. 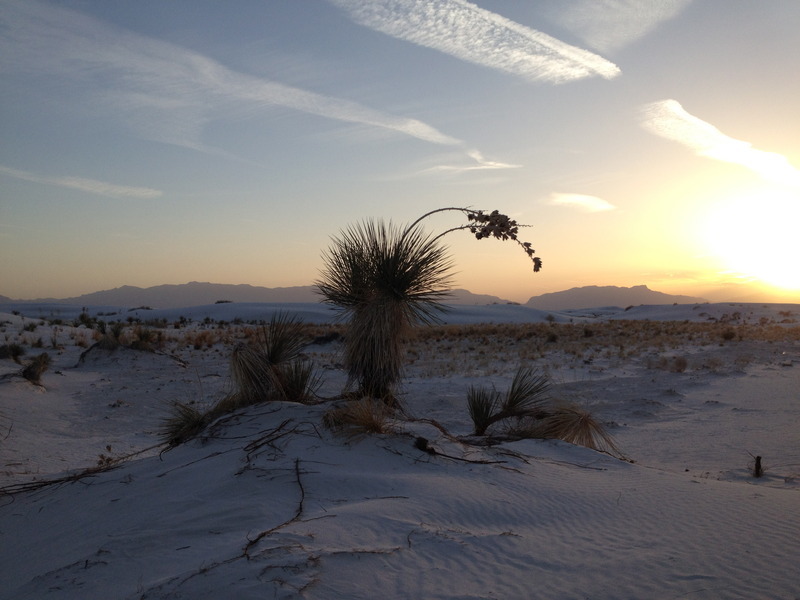 After spending a few days working at the campground, it was high time to visit White Sands National Monument. That was why we were in Alamogordo, after all. We arrived late in the afternoon, hoping to catch an incredible sunset. The paved road that cuts through the park turned from black asphalt to white gypsum sand as the dunes rose up around us. Desert plants defiantly push through the sand, determined to grow. The further we drove the larger the dunes became until all we saw was white. 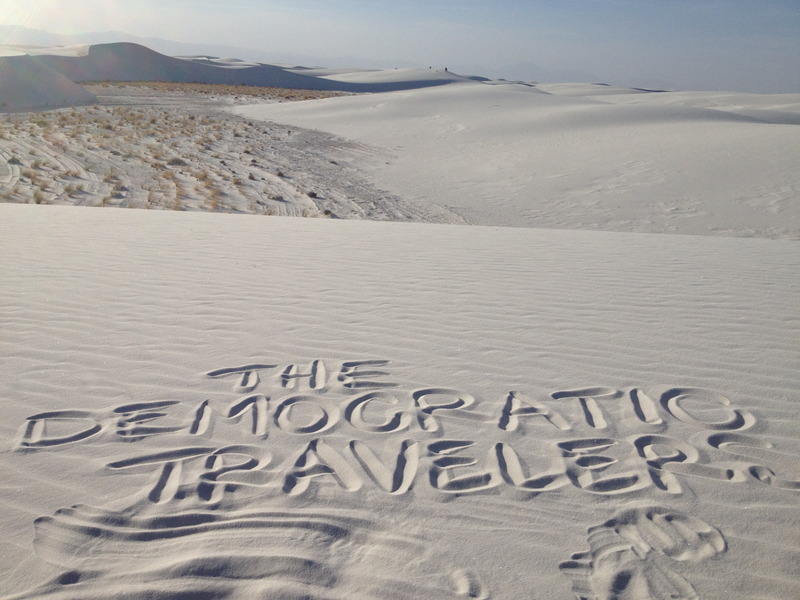 White Sands covers about 275 square miles and you can go anywhere you please. Nothing is off-limits and dogs can roam free. 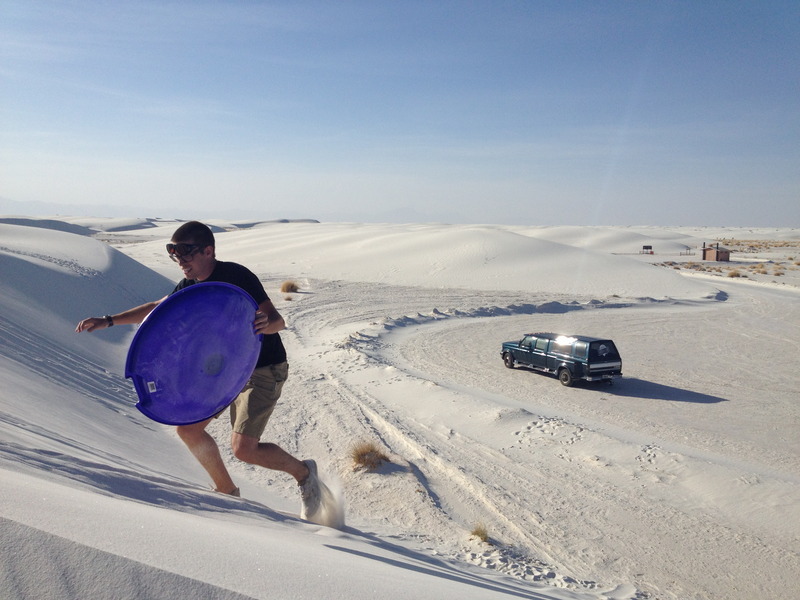 We parked the truck, grabbed the sled we picked up earlier and ran up the nearest dune. Our shoes quickly filled with sand as we high-stepped our way up the ridge. Shoes came off and the fine white sand was surprisingly cool under our bare feet. We quickly exhausted ourselves sledding down the steep dunes and running back up to do it all over again. Bulleit was the happiest, running all over the place and chasing after us. 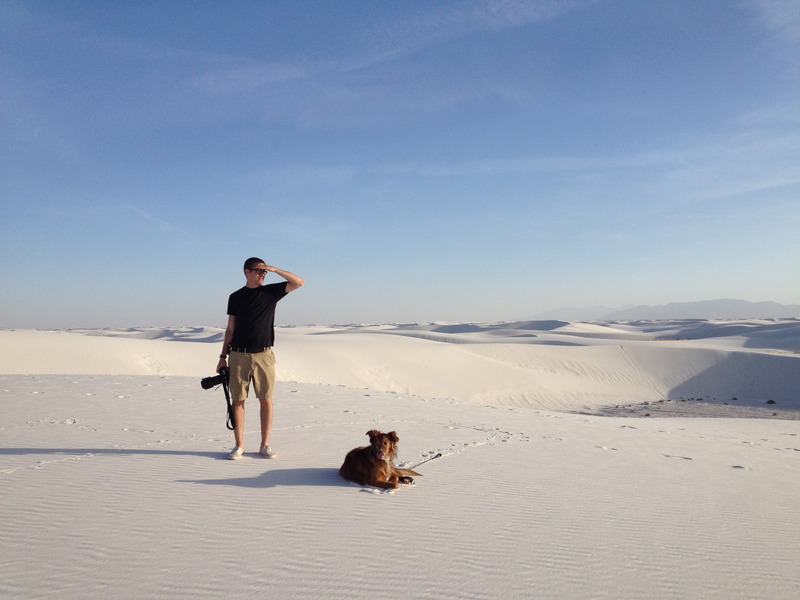 We hiked towards the San Andres Mountains, which run along the western border of White Sands. It's nearly impossible to stop taking photographs of the breathtaking landscape; the light and the dunes are constantly changing. 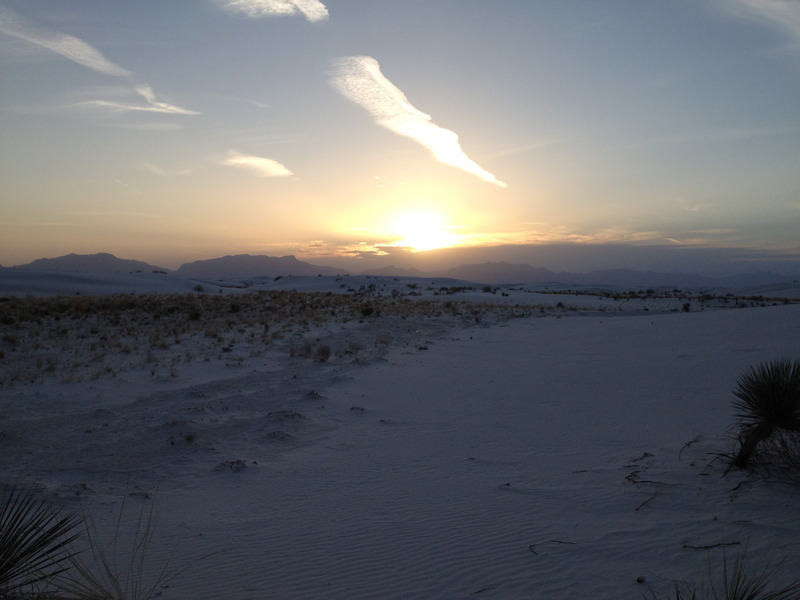 We frolicked across the powdery gypsum sand as the sun was slowly sinking. The undulating white dunes turned from bright white to light blue to lavender, creating shadows that were equally subtle and dramatic. It was one of the most spine-tingling sunsets I've ever seen. These plants may have a rough life, but it sure is pretty. Throughout this trip, I've found that sometimes there is no other way to describe a place than with it's prescribed stereotype or a cliche. 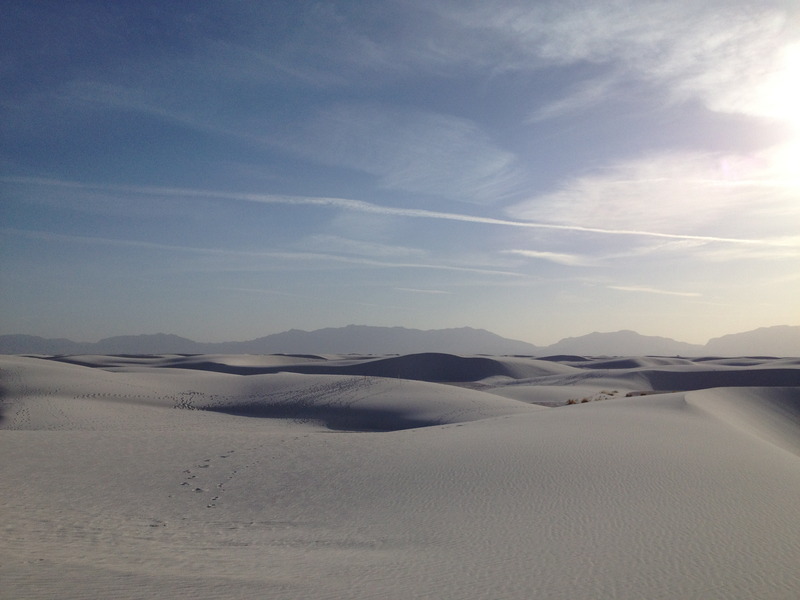 We didn't know much about White Sands National Monument before going there, but had heard that it's "magical" and "it's like being on another planet". After spending the afternoon and watching the sun set over this special place, I would very much agree with both of those assessments. 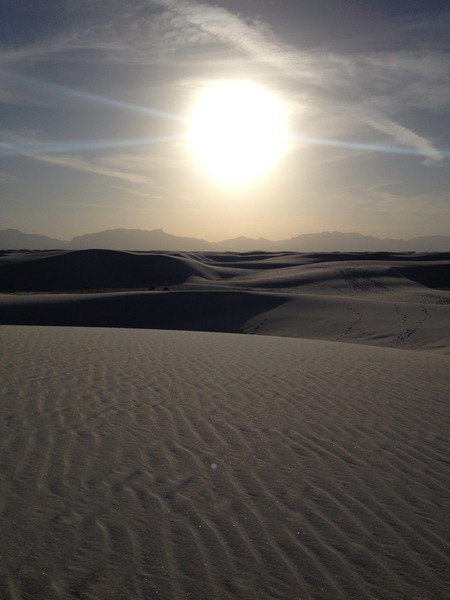 White Sands was truly other-worldy and very magical, unlike any place I've ever seen or experienced in this world. 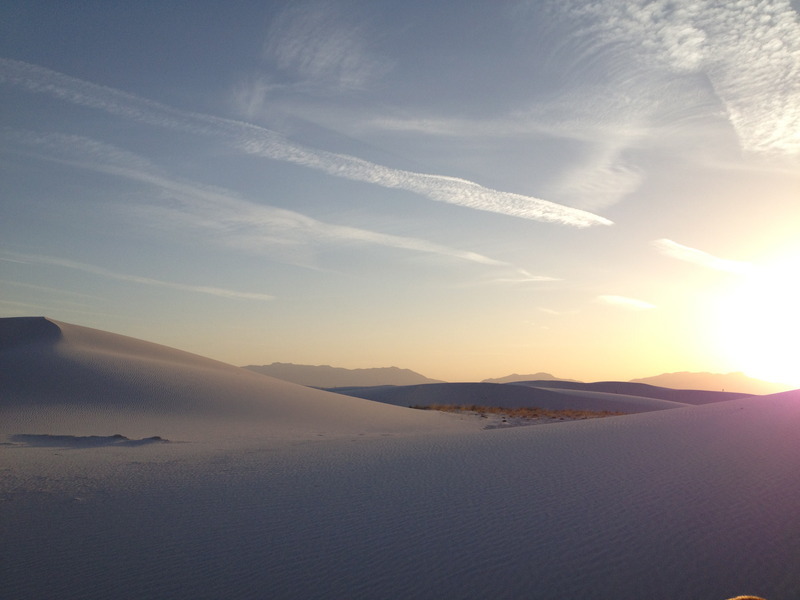 Special thanks to Paul p. (who suggested See the sunset and sunrise over the beautiful White Sands Nat'l Monument) and Jennifer B. (who suggested Go sledding down the dunes. Take pictures) for making this blog post possible!